Through the unique alpine world of the Wetterstein range along the Partnach river on Germany’s highest mountain – with only short rock-slope and cable-grip passages it is possible for the ambitious but sure-footed mountain hiker to ascend the Zugspitze, even without climbing experience. ↑ 700m, ↓ 50m, 5–5.5 hrs. *, Partnach source: additional 30 mins. Train & local bus (route 1 or 2) bring you relaxed to the Olympia-Skistadion ski-jump facility in Garmisch-Partenkirchen. Your tour of the Wetterstein range begins here with a highlight: On a wide path, passing by the Gasthaus Wildenau you will reach the entrance to the Partnachklamm (flume, with entry fee). A good path through this wild and romantic gorge with its roaring waters offers you an impressive natural spectacle. At the end of the gorge the path leads to the south, until a sign "Reintalangerhütte/Knorrhütte", indicates the further course of the path onto a road leading into the valley. Follow this road (an alternate, short and narrow path nearby can be taken here alongside the Partnach river), until it merges into a beautiful hiking path, which once again leads along the Partnach's bank. Remain walking along the Partnach and pass by the Bock Hütte to the beautifully situated riverside Reintalangerhütte (1367 m). A rather unique hut atmosphere awaits you here! If you are still in the mood, you ought to take a short walk in the afternoon to the Partnach’s source – a massive waterfall! Summit of the Zugspitze, in the background the "Zugspitzplatt"
Demanding mountain tour with easy, secured rock face passages and some very steep scree; alpine experience, sure-footedness and a head for heights required! The day begins with the famous “Reintalanger wake-up call”. After breakfast, hit the trail refreshed, initially walking into the valley to the Oberer Anger (head of the valley). Then in steep, sharp bends and following the red markers, keep to the left over the rocky crest to the beginning of the Zugspitzplatt (high karst plateau) and now rather more level again in a large right-hand curve to the Knorrhütte (2052 m). But now it is time (traditional in Bavaria) for a second breakfast. Thereafter you can deposit your superfluous luggage in the hut, and continue with a light day pack: Just behind the hut it briefly becomes steep again, then the path runs across the scree-covered moon-landscape of the Zugspitzplatt to the flat cirque floor, with its cable car terminus SonnAlpin (2576 m). Walk to the right, in front of the terminus across the steep scree slope, past the Schneeferner Haus (not open to the public) to the beginning of the rock faces, which you can pass easily with the help of fixed cables, then to the ridge and over it to the Zugspitzgipfel (summit, 2962 m) with its famous cross, and reach the Münchner Haus. A well-earned light meal can be obtained here. Enjoy the view from Germany’s highest peak and get ready to begin your descent in good time: either with the cable car or via the ascent path described, back to the Zugspitzplatt and down to the Knorrhütte, where you can relax after this quite fulfilling day in the rustic hut atmosphere amid the high-alpine scenery. Some short passages require sure-footedness and a head for heights. 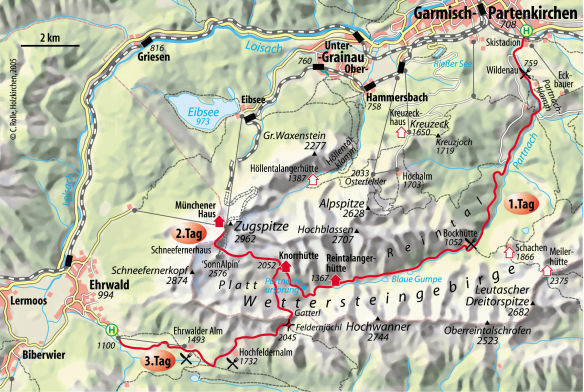 After a restful sleep and once refreshed, get started on the last stage: The going is somewhat up-and-down where the "Plattsteig" crosses over from the hut to the "Gatterl" (run). Finally, steeply uphill, you will come to the narrow wind gap on the Austrian-German border, evidenced by the old frontier-markers. Beyond, the trail leads briefly down over rocky terrain (cable grips) and across to the Feldernjöchl (col, 2045 m). Branch off to the right here and climb along beneath the Gatterlköpfe peaks, then quite steeply down to the serviced Hochfeldernalm lodge (1732 m). A few metres further, a narrow path branches off that will bring you directly to the "Pestkapelle" (plague chapel) and further on a forest road to the Ehrwalder Alm (1493 m). 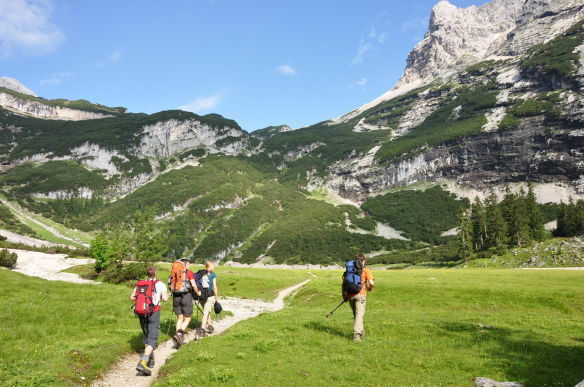 The most comfortable route from here is with the lift down to Ehrwald – but if you prefer to enjoy some more walking, follow the broad hiking path to the lower terminus of the Ehrwalder Almbahn (ca. 1100 m), where the bus will take you to the train station in Ehrwald. Take the Außerfern regional train to Garmisch-Partenkirchen and then back to Munich with German Railways. The ropeway of the Bayerischen Zugspitzbahn from the Glacier-Station "SONN ALPIN" (Zugspitzplatt) to the Summit of the Zugspitze.